La Plata calls us to trailhead coffee at 5:30am and we’re back on the trail by 6:30. Another group of hikers launch even earlier from the Argentine Pass Trailhead and pass us on the ascent with their much lighter backpacks. One of the gentlemen is 72 years old. 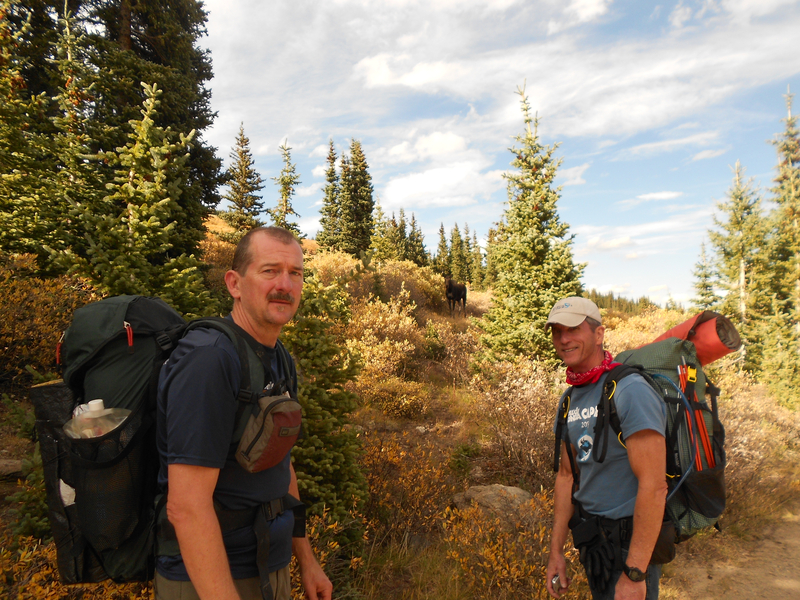 We chat with them on the pass and discover we are trekking backwards on the CDT. 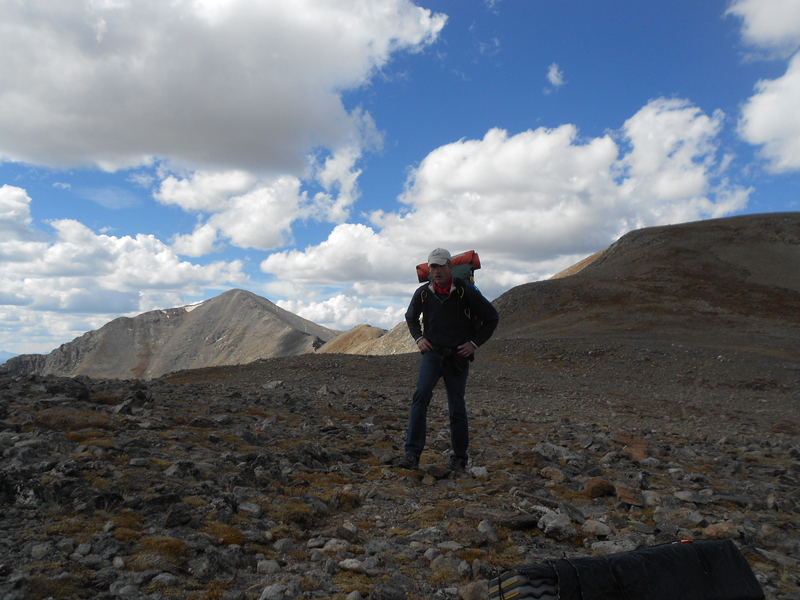 Turns out we should have taken the trail on the left coming off Grays Peak. 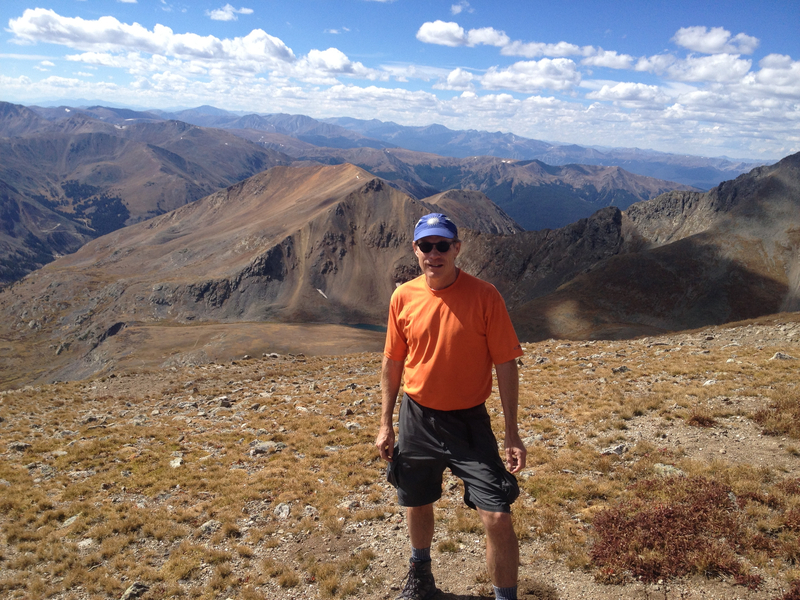 The high point behind La Plata and me in this photo standing atop Argentine Pass is Grays Peak. Rather than bushwhack our way into the valley, the CDT continues along the ridge to the right in this picture. We are correct in that this pass is part of the CDT, but we should be going the other direction. Hmm. We do the math on turning around and determine it will be highly unlikely we will reach Georgia Pass in time for George to make his flight home Sunday evening. 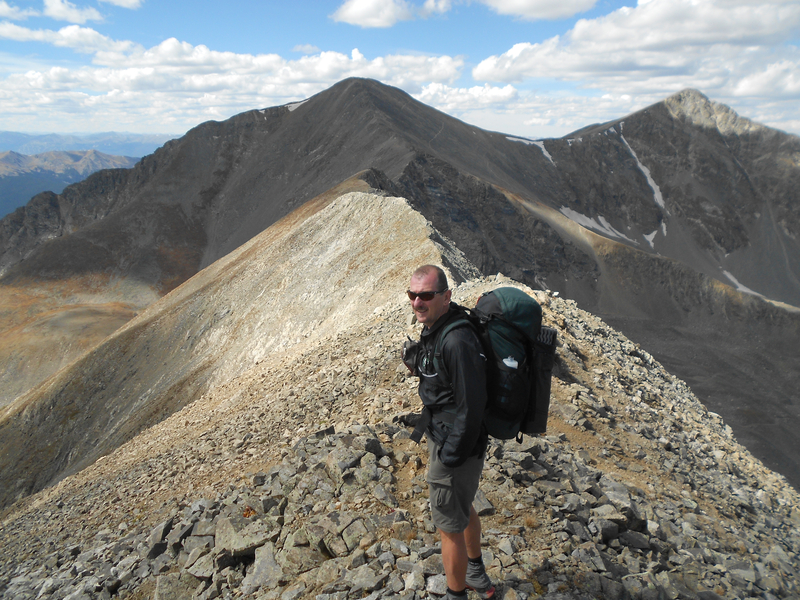 We determine our best course of action is to complete the loop by crossing the ridge we missed and return to our original starting point via Grays Peak. This might allow us to go into town for a nice dinner. We can find a suitable hike for Sunday. We’re flexible. I’m quite excited about the prospect of real food for dinner. While La Plata actually has an agenda to complete the entire CDT from Mexico to Canada – eventually – I’m happy doing whatever. I just like to get out from my basement office and breathe some fresh air. George agrees and we head back toward Grays Peak in a loop. 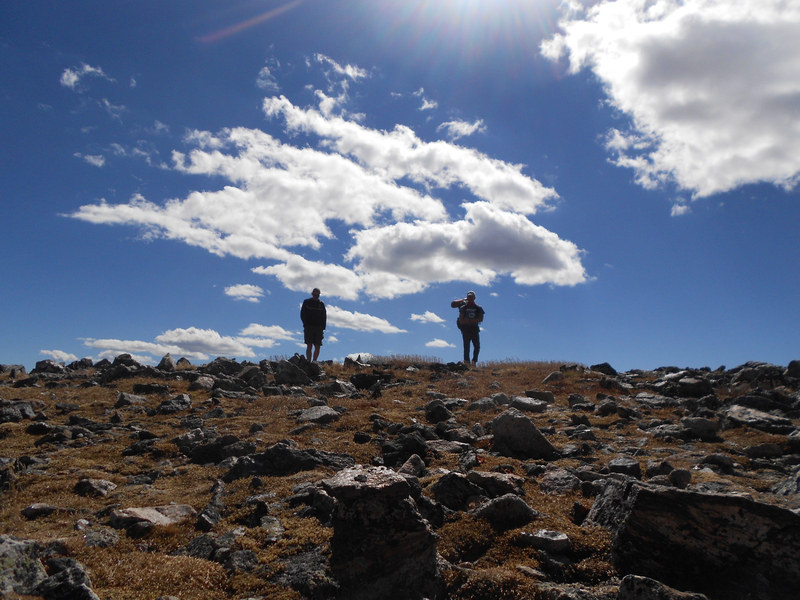 Much of the trail resembles the photo above with La Plata and George walking seemingly aimlessly among the rocks and tundra above treeline. Apparently this section of the CDT entertains few hikers because there is no discernible trail. 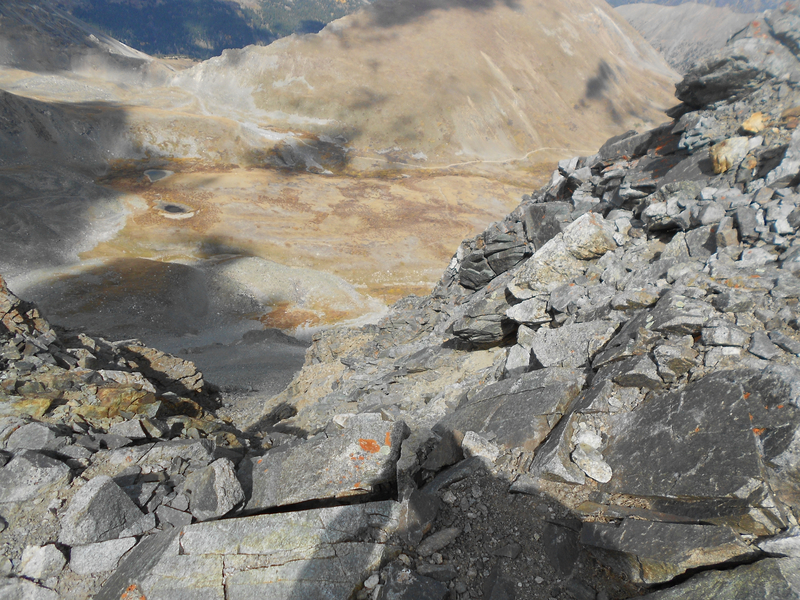 The path is essentially a ridge though, connecting Argentine Peak to Argentine Pass to Mount Edwards to Grays Peak. We try to follow the cairns, or in narrower sections, simply stay between the edges. The ridge varies in width from 50 yards to maybe 10 yards. The view is incredible. This photo looks down into Horseshoe Basin, where we camped the previous night. That’s Ruby Mountain behind me. George and I are both a little disappointed that we aren’t now hiking down slope. 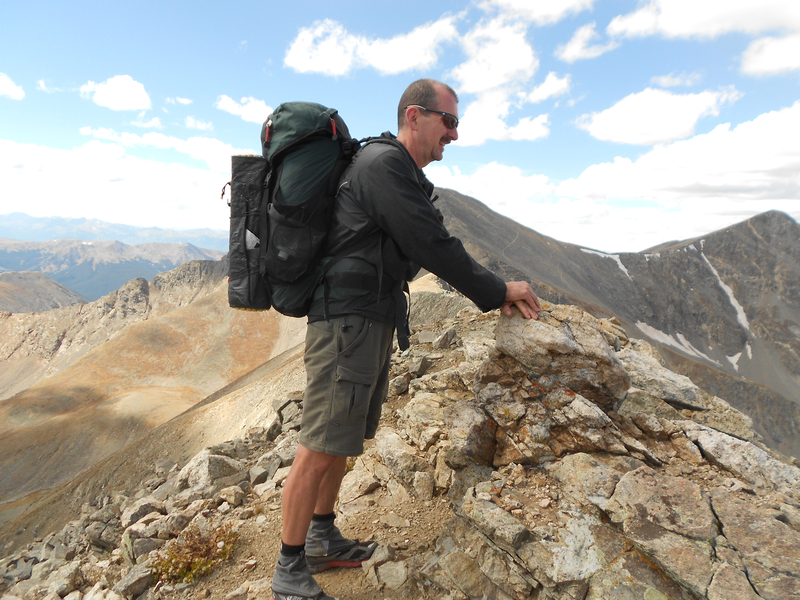 Argentine Pass is the highest pass on the CDT. Climbing it for breakfast was no small effort. 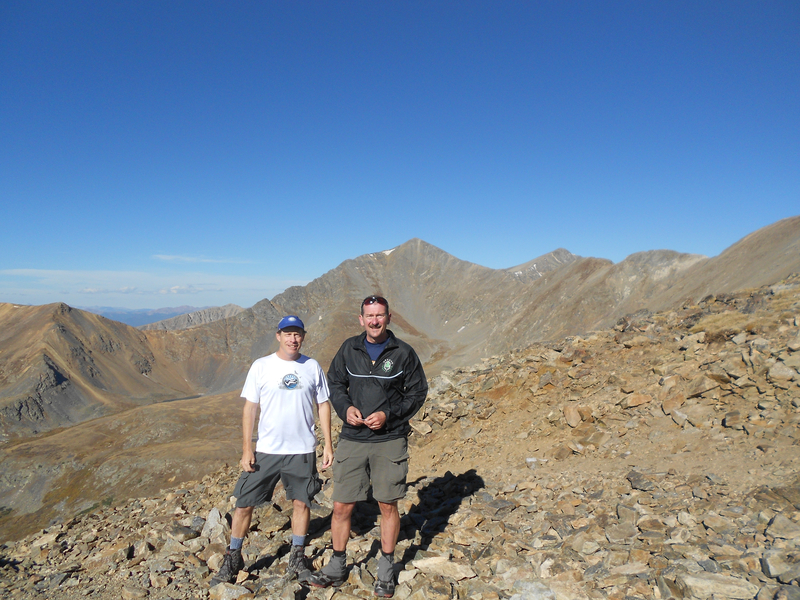 This ridge is a series of hills undulating up and down, with Mount Edwards as the high point until reaching Grays Peak. We don’t reach Grays Peak though. 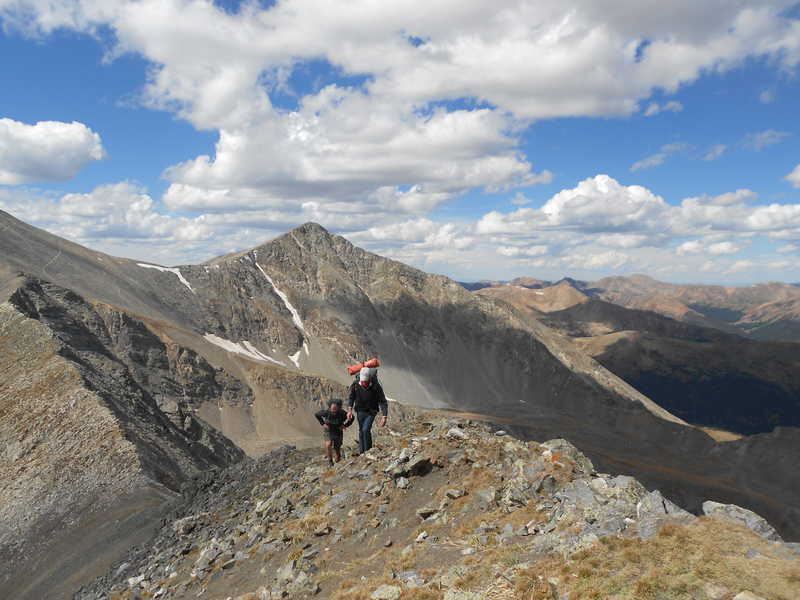 As you can see in this photo of La Plata descending Mount Edwards towards Grays Peak, the ridge begins to narrow. The section beyond is referred to as a knife edge. In this photo, La Plata demonstrates the need to begin holding on to the top of the ridge for balance. This isn’t nearly as thin as the ridge eventually becomes, but I’m not comfortable taking pictures on the more exposed sections. I need both hands. We traverse some extremely exposed trail, above 2000 foot slopes. I’m surprised with myself that I am comfortable with it. We don’t reach the even scarier parts though. With this view looking down 2000 feet as motivation, we make the decision to turn around. None of us feel uncomfortable with the exposure. 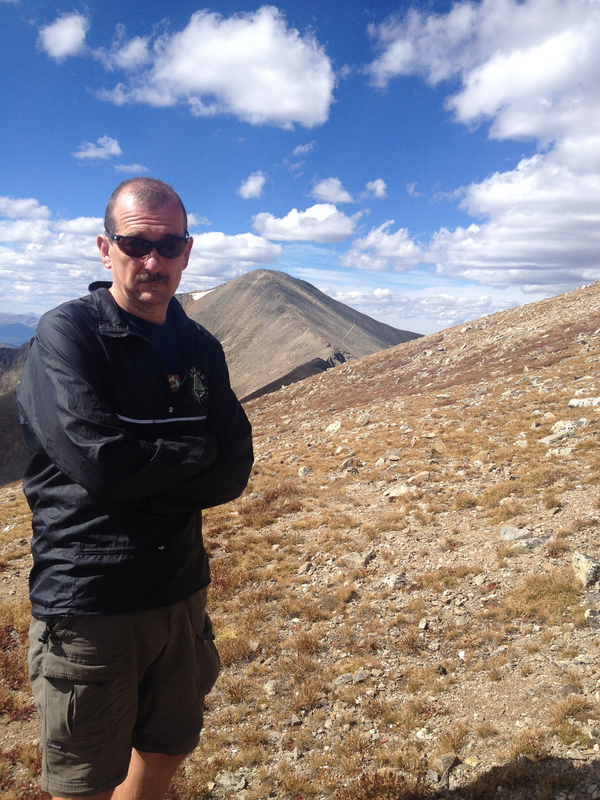 But we figure it will take us four hours to cross this series of increasingly more exposed ridges to Grays Peak. Carrying 35 pound backpacks is the reason for our slow pace. It also will lead to balance issues. We know that we will be highly fatigued after two hours of this unnerving trek and that we will begin to lose confidence in our footing. Having to take another step, totally bonked, with no room for error, is not something any of us care to experience. We also expect the chance of rain, with the corresponding lightening, while out on the knife edge. We make the tough call to turn around. I say tough call because we really have no good plan at this point for getting home in time. Our first thought is to hike out of Horseshoe Basin below. We don’t have a map so we don’t know the distance, but suspect we could find our way to Keystone. And we could do so by end of day Sunday assuming we can hitch a ride along the way. We discuss options as we hike back over the ridge. None of us are overly concerned. We made the right call for safety. We are now faced with the possibility of walking until Monday afternoon plus likely needing to hitchhike to reach our car. I learn a little something about La Plata and George. Like me, this is just another part of the trail. We almost enjoy it. We take it in stride and work the problem. We encounter a half dozen jeeps and another six quads upon our return to Argentine Pass. We’ve fully considered the route out Horseshoe Basin and ask them about what’s on the other side. Jeeps can’t drive over the pass but can only come up on the eastern side. We figure from Georgetown. It’s exceptional really just how ignorant most of these tourists are of where they came from. I say this knowing full well that I’m essentially lost myself. One guy tells us it was just a forty minute drive on his Quad from Georgetown. That equates to an easy hike for us but I know if that were true, I would be able to see the town from here. No one can actually tell us anything meaningful. It’s like even the drivers weren’t paying attention. One does consult his GPS, after I prompt him too. 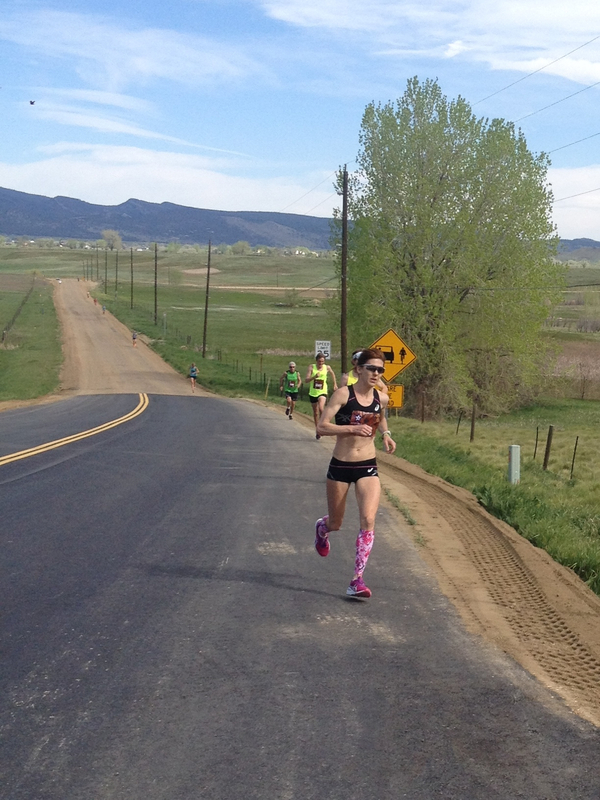 That tells us it is 17 miles to Guanella Pass Road, and another 3 miles to Georgetown. We determine that is doable and more deterministic than hiking toward Keystone. We have a new plan. We save time on the descent by bushwhacking straight down, cutting across all the jeep road switchbacks. We nearly beat some of the jeeps down. The bottom begins a comfortable trail that follows an old mining railroad. The gradual grade helps our legs recover after the brutal plummet off the pass. And we are rewarded for our efforts by sighting this moose. Not something one sees when roaring by in a loud vehicle. To see the moose, you might have to click to enlarge the photo. 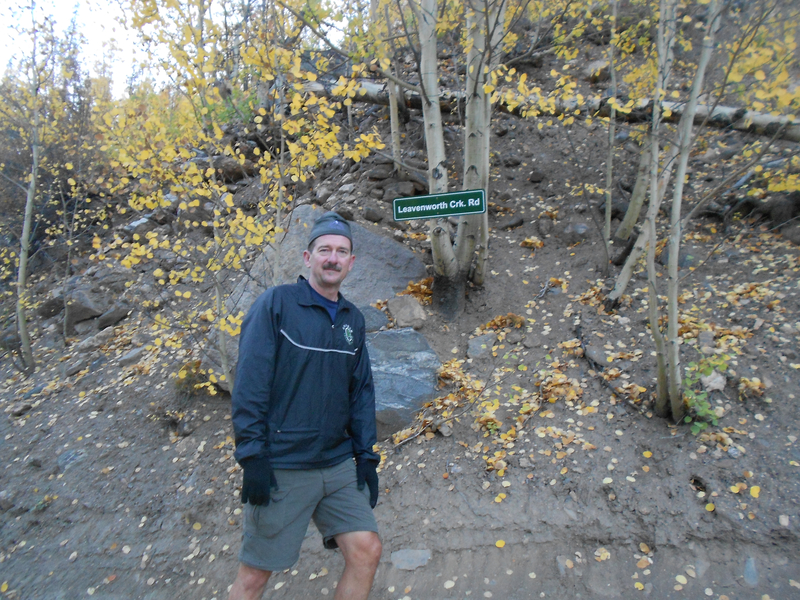 We have to hike for several hours along this jeep road, but it turns quite picturesque with Aspen trees. We encounter a mountain biker who informs us we don’t need to hike to Georgetown. There’s a trail that splits off the road that leads to Silver Plume. At that point, it’s only a 3 mile hike into town. It takes us until nearly nightfall to reach this point and we setup camp. Our camp site is across from a large chimney that apparently used to have a house attached to it. We learn later this is Pavilion Point. 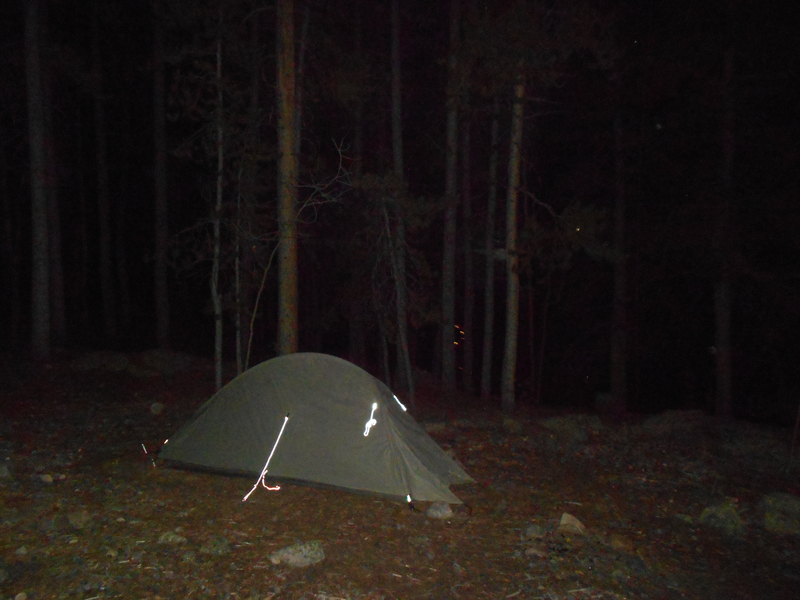 If you click on this photo of my tent, you’ll notice a line of car lights in the distance. Three miles downhill is I-70. We are so close to Silver Plume, we can taste breakfast. We suspect the walk from there to our trailhead might be 6 miles, give or take. We should be fine. Fantastic scenery and photographs. Did you go without a map? I always take a map when hillwalking, as I’m not usually camping and need to get home! Thanks Julie. I did go without a map because I was fairly familiar with the general area, if not specifically the trail itself. I did have a map on my iPhone but it was more fun to figure things out without it. I think you should consider a flexible, portable solar panel you can hang form your pack during the day to charge your phone battery so you can use mobile maps on extended trips. I don’t have any specific suggestions but I know that this type of stuff exists. 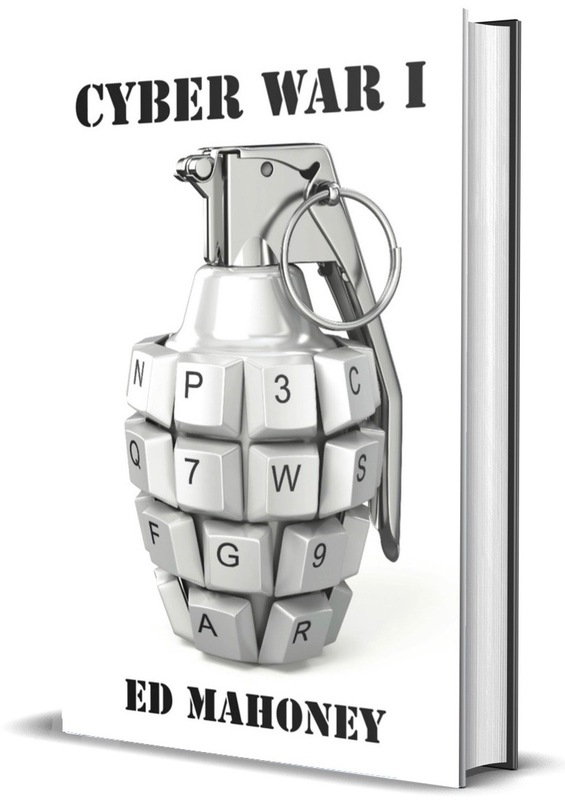 You know me, I am a gadget guy! I do turn off my cell and wifi antennae to conserve battery, but I also do not have a signal. I think I need a signal for the GPS to work. Maybe not. Need to look into it. Nope, no signal required for the GPS. It gets the signal from the satellites, so unless you are underground it should work. Check out the Gaia GPS app on iTunes. It works on your tablet as well, has storage in the cloud so you can view your trips on any of your iOS devices.